Originally published under the title, "Could the Iran Deal Be the Worst International Accord of All Time?" 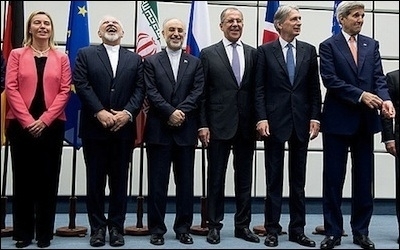 Iran's negotiators (second and third from left) have good reason to be happier than their Western counterparts. Barack Obama has repeatedly signaled during the past six and a half years that that his No. 1 priority in foreign affairs is not China, not Russia, not Mexico, but Iran. He wants to bring Iran in from the cold, to transform the Islamic Republic into just another normal member of the so-called international community, ending decades of its aggression and hostility. In itself, this is a worthy goal; it's always good policy to reduce the number of enemies. (It brings to mind Nixon going to China.) The problem lies, of course, in the execution. Obama's conduct of the Iran nuclear negotiations has been inconsistent, capitulating, and deceitful to the American public. The conduct of the Iran nuclear negotiations has been wretched, with the Obama administration inconsistent, capitulating, exaggerating, and even deceitful. It forcefully demanded certain terms, then soon after conceded these same terms. Secretary of State John Kerry implausibly announced that we have "absolutely knowledge" of what the Iranians have done until now in their nuclear program and therefore have no need for inspections to form a baseline. How can any adult, much less a high official, make such a statement? The administration misled Americans about its own concessions: After the November 2013 Joint Plan of Action, it came out with a factsheet which Tehran said was inaccurate. Guess who was right? The Iranians. In brief, the U.S. government has shown itself deeply untrustworthy. The agreement signed today ends the economic sanctions regime, permits the Iranians to hide much of their nuclear activities, lacks enforcement in case of Iranian deceit, and expires in slightly more than a decade. Two problems particularly stand out: The Iranian path to nuclear weapons has been eased and legitimated; Tehran will receive a "signing bonus" of some US$150 billion that greatly increases its abilities to aggress in the Middle East and beyond. Of all the administration's foreign policy mistakes, none have been this potentially catastrophic. The United States alone, not to speak of the P5+1 countries as a whole, have vastly greater economic and military power than the Islamic Republic of Iran, making this one-sided concession ultimately a bafflement. Of the administration's accumulated foreign-policy mistakes in the last six years, none have been catastrophic for the United States: Not the Chinese building islands, the Russians taking Crimea, or the collapse into civil wars of Libya, Yemen, Syria, and Iraq. But the Iran deal has the makings of a catastrophe. Attention now shifts to the U.S. Congress to review today's accord, arguably the worst treaty not just in American history or modern history, but ever. Congress must reject this deal. Republican senators and representatives have shown themselves firm on this topic; will the Democrats rise to the occasion and provide the votes for a veto override? They need to feel the pressure.